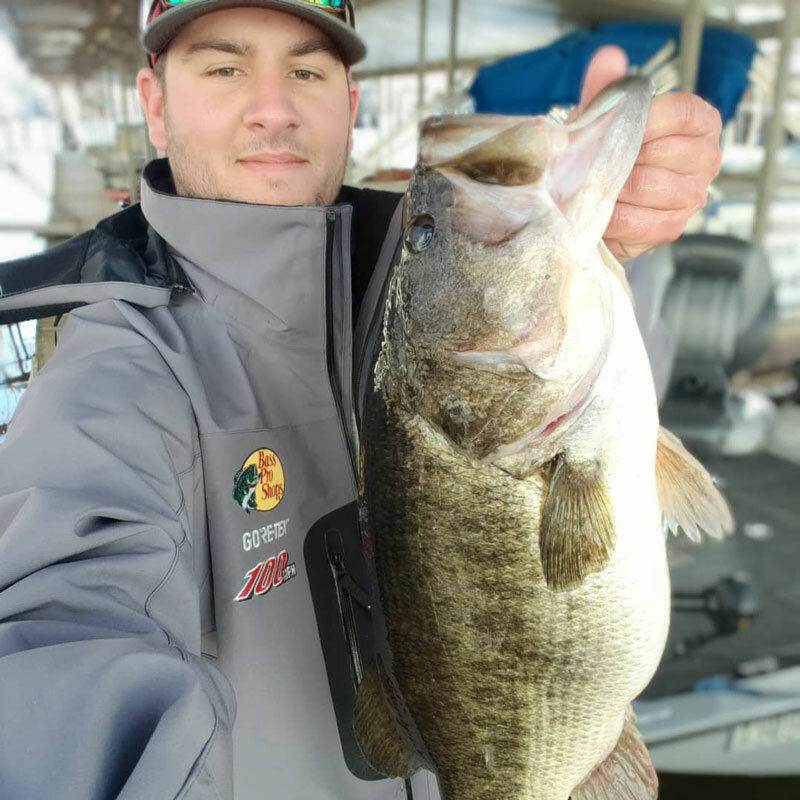 Austin LeJeune pounded the shallow water trees and grass on Caddo Lake for four days last week. And even catching a few good fish his first trip to the Louisiana-Texas border lake north of Shreveport, which is a long trip from his home in Plaquemine, wasn’t exactly what he hoped for. He fished for hours with no bites. During the trip, he broke off six really good bass and even damaged his trolling motor prop on a stump late Thursday helping rescue two people from the cold water after their canoe turned over. He had to drive 30 miles to have it fixed and drove back to the lake contemplating calling it quits and not even fishing Friday morning. Now he’s glad he did go. 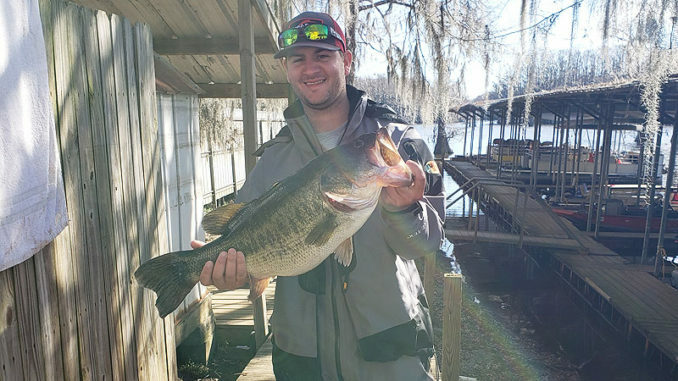 Perseverance paid off and he landed a 12.02 lunker that was 25.5 inches long and had a 21-inch girth about 7:45 Friday morning. 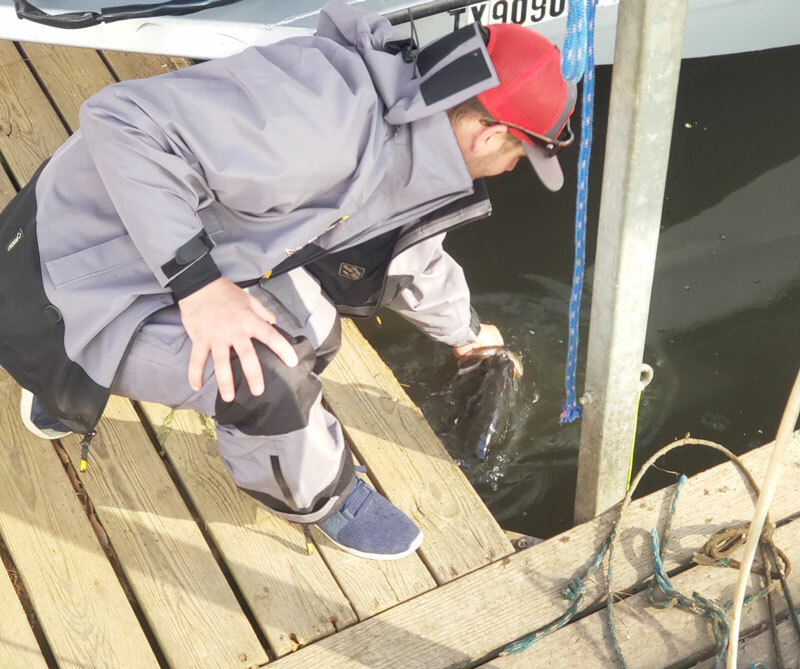 He officially weighed the fish at Shady Glades Resort, took photos and videoed the release of the big fish back into the lake to spawn as part of the BASELINE Trophy Replica program. 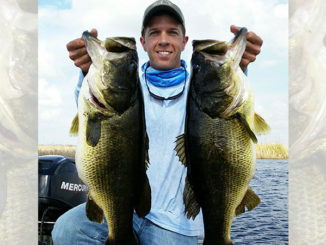 That bass exactly doubled the size of the largest bass he had previously caught. “It was unbelievable now that I look back,” he said. “I had a lot of bad luck. The weather was cold, then rainy, and breaking off the big fish was tough. 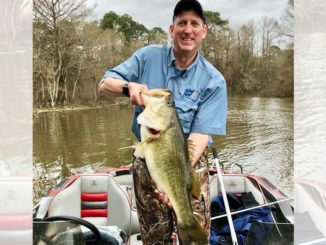 In fact, after I broke my trolling motor Thursday afternoon, I even told my girlfriend that with my luck, I’d never catch a big one.” That big old Caddo bass proved him wrong. After he landed the sow, the magnitude of what had happened didn’t set in for quite a while. He caught the fish, then weighed it on a scale he had just purchased days before at Bass Pro in Bossier. It said 11.09 pounds. He wasn’t sure, so he sent a photo to his uncle, who told him it didn’t look like the fish quite weighed 10. He put her in the livewell, then about 30 minutes later, took her back out and weighed her. This time it said 11.1 pounds. A man fishing nearby weighed it on his and it read 12.1. He encouraged LeJeune to get it to the resort and weigh it. That’s where the official weight hit 12.02. 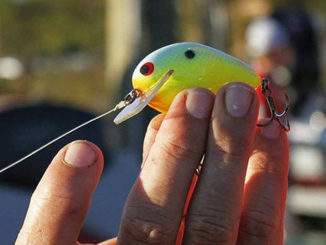 LeJeune landed the fish on a black and blue Missle Bait D-Bomb, fishing around a group of trees where he had caught — and lost — several good fish during the week. He got a solid tap, set the hook and the fish headed for deeper water. It got stuck in the grass, but he could feel her shaking her head. She broke free from the grass and made a couple of dives before trying to circle to boat. He never even realized how big she was, even when he lipped her and put here in the boat. He just knew it was the biggest bass he ever caught. 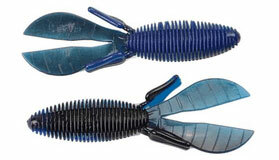 This is the bait LeJeune used to catch his 12.02 lunker, a black and blue Missle Bait D Bomb. His girlfriend, Casey, had decided to not go Friday and she couldn’t believe what he had caught. It was her dad, a regular at Caddo, who convinced him to make the trip north after a whopper. A bit of planning saved the day for Austin. Friday morning as he went out for a couple of last hours of fishing before he had to check out, he decided he was not going to lose anymore big fish. He upped his line size to 20 pound test. He retied his lure just minutes before the big one hit. He firmly believes that is why he was able to catch her. “She was just at the right place at the right time. I was just at the right place at the right time,” he said. 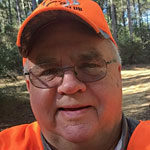 Kinny Haddox has been writing magazine and newspaper articles about the outdoors in Louisiana for 40 years. He also publishes a daily website, lakedarbonnelife.com. He and his wife, DiAnne, live on Lake D’Arbonne in Farmerville.